The First Minister said Theresa May's draft agreement was 'bad for Scotland'. Brexit has "immeasurably" strengthened the case for Scottish independence, Nicola Sturgeon has told STV. Speaking to Scotland Tonight after Theresa May received the backing of her ministers over the draft agreement for leaving the EU, the First Minister branded the deal as "bad for Scotland". Ms Sturgeon likened the deal to being "blackmailed into a choice between the frying pan or the fire" and said she believed the deal would be rejected by the House of Commons. "We shouldn't accept a bad deal," she said. "If that deal is rejected by the House of Commons, then a no-deal exit is not inevitable. What should happen then is that other options should come back on the table. "As we know, there is no majority in the Commons for crashing out without a deal." The First Minister said she was likely to speak to Ms May about the agreement late on Wednesday evening. She said a request to talk to Ms May before the cabinet meeting had been rejected. "That might be a small thing," she said, "but it really illustrates the lack of respect and lack of serious engagement there has been with the Scottish Government throughout this whole sorry saga." 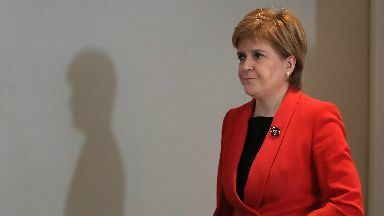 Ms Sturgeon reiterated her support for another referendum after the final terms of the deal were known, and promised to set out her thoughts on a second independence referendum after the Commons debate. She added: "The last couple of years, the whole experience - from Scotland facing being ripped out of the EU against our will, to the Scottish Government being sidelined in these negotiations, the powers of the Scottish Parliament being undermined in the process and the views, wishes and interests of Scotland being completely ignored has immeasurably strengthened the case for Scottish independence."